I'm not entirely sure how this happened but I caught an advert on TV - and got sucked in!! Now I'm not trying to brag here that I don't usually get sucked in by adverts - I do, I'm human......what I mean to say is I don't usually get to watch programs when they are aired - I end up watching TV on catch up and Sky+ when little one has gone to bed. Somehow, probably on Boomerang - the Tom and Jerry channel! 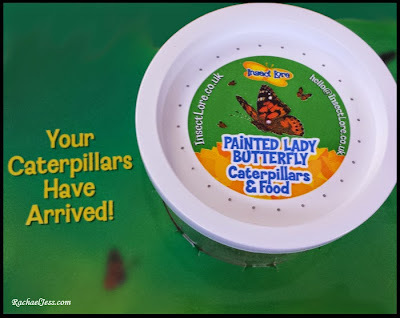 I caught the advert on growing your own butterflies from caterpillars sent to you - thanks to Insect Lore and found myself thinking about the advert the rest of the day!! Put a status up on Facebook and found other parents had either done this project before or thinking about doing it. I'm not entirely sure who got the most enjoyment out of this. When our caterpillars arrived we put them up on the shelf out of direct sunlight and watched them grow. Funny little things they are. Shedding and silk threads, food and growth all in the space of 7 days! Then, they all started making their way to the lid to form the pupa stage. 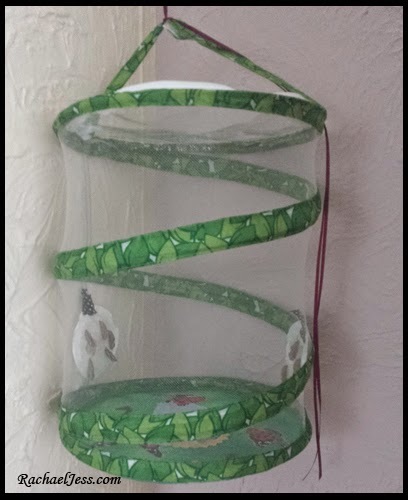 This took a couple of days to complete and we had a moment when Max picked up the cup only for one of the caterpillars already in its chrysalis to fall!! Oh, my days! I did worry about that one! Yes, this project comes with stress! And there they stayed, growing, getting darker and waiting...... waiting for us not to be looking - to emerge! We managed to miss every single one of them! 3 appeared overnight so they have a good excuse. 1 waited until I was in the bath - and that was the one that had fallen from the cup. More appeared that night and whenever we popped out. We caught them just after, stretching their crumpled wings and it really was the most amazing thing to watch. Once all the butterflies had hatched we kept them for a couple of days with twigs and flowers and nectar. Then the moment came to let them go. We took them out into the garden near the trees and opened up the tube and with a little help set them free. It's been a fantastic experience and will definitely be doing it again. 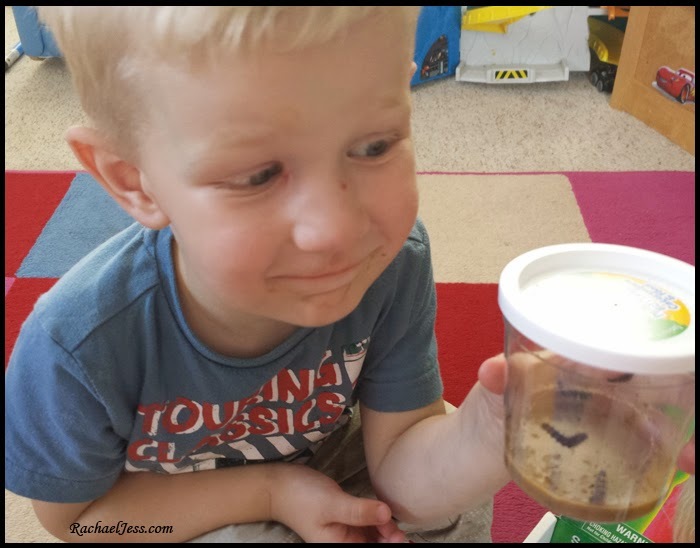 We may even try other bugs... but that's a big maybe, not sure I'll feel the same about stick insects as I do about beautiful butterflies. It's great to see them growing, I had no idea you could put them in those type of baskets! It must be so interesting to see them develop, so thanks for sharing it with us.